Net Asset Value (NAV) is the total value of assets net of the gross debt of the Holdings System as defined below. In determining the total value of assets at December 31, 2016 listed equity investments and other securities are valued at trading prices, unlisted equity investments are valued at fair value determined annually by independent experts and unlisted other investments (funds and similar instruments) are valued by reference to the most recent available fair value. Bonds held to maturity are valued at amortized cost. Treasury stock are valued at the official stock exchange price, excepting those destined to service stock option plans (measured at the option exercise price under the plan if this is less than the stock exchange price) and those assigned to the beneficiaries of the stock grant plans which are deducted from the total number of treasury shares held. The sum of the aforesaid values constitutes the total value of assets (Gross Asset Value). Gross debt is the total amount of the financial debt of the Holdings System. The elements included in the gross asset value and in the gross debt denominated in U.S. dollars and Pounds sterling are translated to Euro at the official exchange rates at the date of the period indicated in this presentation. At December 31, 2016 EXOR’s NAV is $14,642 million, an increase of $1,287 million (+9.6%) compared to $13,355 million at December 31, 2015. The completion in March 2016 of the investment in PartnerRe led to an increase in EXOR’s overall exposure to assets denominated in U.S. dollars and accordingly, from January 1, 2016, NAV and NAV performance are reported in U.S. dollars. The performance benchmark has also been changed and is now the MSCI World index in U.S. dollars. 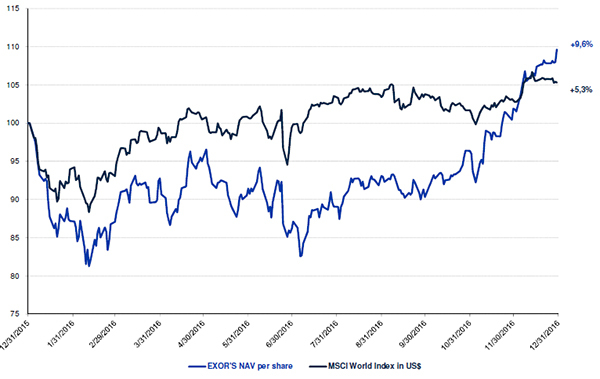 Finally, from January 1, 2016 EXOR presents its NAV per share data in US dollars amounting at December 31, 2016 to a NAV US$60.75 (€57.63). The following pie chart shows the composition of gross asset value at December 31, 2016 ($18,467 million). “Other investments” include the investments in Juventus Football Club, Welltec and Banca Leonardo, in addition to minor sundry investments.